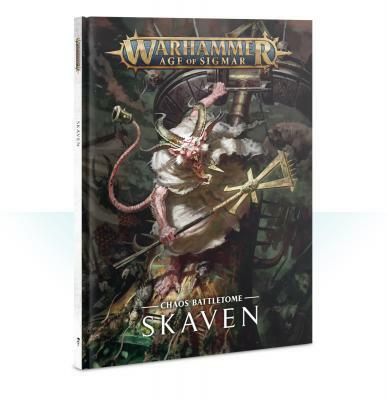 In this 128-page hardback battletome, you'll learn about the history of the Skaven in the Mortal Realms – from their origins in Blight City to their role in the Soul Wars, all illustrated with stunning and evocative art. You'll also find lore on their many clans and the brutal inner workings of skaven society. The battletome goes on to cover how the skaventide goes to war, showcased by several warscroll battalions, and all the warscrolls needed to field a force of ratmen on the tabletop. You’ll be able to mix-and-match a variety of skaven clans to build a killer army to suit your tastes – slaying your enemies with endless hordes of Clanrats, blasting them apart with the terrible technology of the warp lighting-wielding Stormfiends, and unleashing vile monsters of arcane science like the Hell Pit Abominations. All are goaded into battle by the scheming, backstabbing members of the Masterclan! Battletome: Skaven lets you customise the leaders of the skaven with a selection of warpstone-infused artefacts and cunning sorceries. Their spells come from the Lore of Ruin, a collection of sinister curses, and the Lore of Warpvolt Galvanism, arcane arts that enhance Skyre units and incinerate your foes. The book is also a great resource for collectors, packed with examples of different colour schemes to inspire your own projects, as well as painting tips. The section on Path to Glory rules and a pair of bespoke missions are great for organising and playing your first games with this insidious army. This book contains: - Allegiance abilities for skaven, including a variety of battle traits – 6 separate types of artefacts of power and 6 types of command traits - 2 spell lores – the Lore of Ruin (for use by Grey Seers) and Lore of Warpvolt Galvanism (for use by Clans Skryre Wizards) - 2 battleplans - Path to Glory rules for creating a skaven warband for Path to Glory, including Champion and Followers Rewards Tables - 8 warscroll battalions - 40 warscrolls, 3 endless spell warscrolls and a warscroll for the Gnawhole scenery piece. - Pitched battle profiles for all units and Endless Spells featured in this battletome If you’re starting a new skaven army or bringing your classic collection into the Mortal Realms, this battletome is your essential companion.